The Samsung Galaxy Watch is the best smartwatch Samsung has ever made. It's more attractive, has brilliant battery life, and comes packing some neat new fitness tracking abilities. The Galaxy Watch's biggest problem is that Samsung hasn't given you a killer reason to buy one and keep wearing it. The Samsung Galaxy Watch is here, officially announced along with the new Note 9 smartphone at Galaxy Unpacked 2018, and we've been wearing the 42mm Rose Gold model for the past couple of weeks. The first thing you'll notice is that Samsung has dropped the 'Gear S' naming convention, and called its new smartwatch the Galaxy Watch. The big question is, are the updates big enough to reflect the brand new name or is the Galaxy Watch simply a stylish sequel to the Gear Sport that should also appeal to a broader audience? Does Samsung now have the weapon in its locker to take down the Apple Watch? We'll tell you straight away, no. Apple is too far ahead in the smartwatch arms race. If you have an iPhone, the best option for you is still an Apple Watch, of course, there are millions of Android users out there looking for an Apple Watch alternative, that's where the Galaxy Watch comes in. Here are my thoughts on the Samsung Galaxy Watch. The Samsung Galaxy Watch price will, for long standing fans of the series, come as a pleasant surprise, as it starts cheaper than the Gear S3 did at launch. The 42mm version of the watch, which is the smaller size, starts at £279, while the larger 46mm version starts at £299. In contrast, the Gear S3 cost £349 at launch, so providing you plump for the smaller model, this time you can get hooked up for a lot less. These prices are for the Bluetooth variants of these sizes, with LTE / 4G variants costing more and coming a little later in the year. The Samsung Galaxy Watch is available to buy now. In terms of network support and retailers, in the UK EE will be supporting the Samsung Galaxy Watch, and will be the place to purchase the 4G version of the smartwatch. The Galaxy Watch comes in two sizes 42mm or a larger 46mm model, and three colours, Rose Gold, Midnight Black and Silver. Straight out of the box the first thing that grabs you about the Samsung Galaxy Watch is that, more than ever before, this smartwatch looks like a real watch. The key is the large circular face, as well as the metal body. If you're looking for something that's more traditional than the Apple Watch, it'll be perfect for you. For us, this creates a slight sense of unease. While the Apple Watch is an iconic design and like nothing that came before it, the Galaxy Watch is simply an inferior imitation of traditional watches. Why is it inferior? Because most of the time, if you value battery life and have the always-on display turned off, the Galaxy Watch display will be a black circle. Samsung also can't match Apple when it comes to build quality. The most affordable Apple Watch feels much more expensive than it actually is, and sits so comfortably on the wrist it's almost invisible. The Galaxy Watch doesn't feel terrible, but it certainly feels cheaper in comparison. It's more like a piece of technology than a piece of jewelry. Luckily, design is subjective, and while its not to my tastes, you might love it. If, like me, you're not a fan of the design, the Galaxy Watch has a tonne of redeeming features to win you over. The best of which is how you interact with the watch. In terms of ergonomics and usability, the Samsung Galaxy Watch is the best smartwatch out there. The rotating bezel and two buttons are an excellent way of navigating the UI, cycling through of apps and menus. The bezel has a satisfying click when its rotated – it's very tactile. The 42mm Galaxy Watch, which has a 1.2-inch display and overall dimensions of 41.9 x 45.7 x 12.7mm, can be paired with 20mm straps. It's a nice size, and sits well on my 17cm wrists. Meanwhile, the 46mm Galaxy Watch features a larger 1.3-inch screen and added weight (63 grams instead of 42). The larger 46mm version of the Galaxy Watch is also the variant that grants you the much-hyped new battery, with a 472mAh stack of cells loaded in to it, which is a marked increase from the 270mAh in the 42mm. I haven't tested this version yet (mainly because it's too large for my wrists), but our sister site Techradar claims the battery lift lasts between four and five days. That's very impressive. I've been getting between two and three days with the smaller, 42mm model. Finally, in terms of hardware, both the Bluetooth and LTE/4G versions of the Galaxy Watch pack the dual-core 1.15GHz chipset and 4GB of internal storage space. Where the models differ is that the LTE/4G Galaxy Watch has more RAM (1.5GB), compared to the Bluetooth models' 768MB. This is likely due to the extra grunt needed to maintain a mobile connection. In terms of OS, the Galaxy Watch retains Tizen, now in its 4.0 incarnation. This is compatible with all Android phones that are running Android 5.0 and later, and it will also work with any iPhone running iOS 9 and above. It's the best thing about the Galaxy Watch, and is the best smartwatch user interface we've ever used. Navigating is so simple, fast and intuitive, shaming Wear OS and watchOS. Unfortuntely, just like previous generations, Tizen is also the watch's biggest downfall, as it has little-to-non-existant third party support, forcing you to use Samsung's built-in apps. 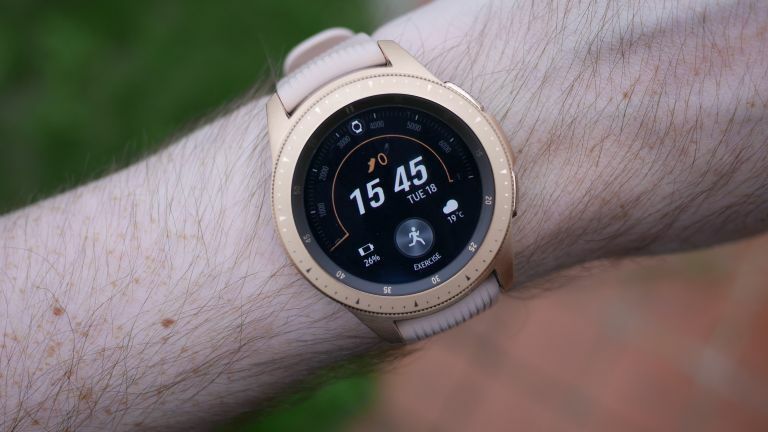 Health is a major focus for the Galaxy Watch, and as such Samsung Health is now expanded with new stress management and breathing features, as well as a collection of 21 indoor exercises and 39 tracked workouts. You can easily switch between the various tracking functions and modes by rotating the Galaxy Watch's bezel. You'll find the Galaxy Watch accurate enough if you're a casual user, but it won't replace your Garmin or Suunto if you're training for a marathon. As well as exercise tracking the Galaxy Watch will also measure your stress, remind you to breath deeply, and give you a neat little stress score (it should do this automatically, but ours didn't, which was quite stressful in itself). And of course there's sleep tracking, although, we found the watch too uncomfortable and bulky to wear while sleeping. In other new features, the Galaxy Watch now features Bixby, Samsung's AI voice assistant, which replaces S Voice on the new smartwatch. Unfortunately, this seems like nothing more than a rebrand, as Bixby is almost as useless as S Voice on the Gear S3. Google Assistant would have made voice control experience much better. Since our initial review we've also tested the 4G version of the Samsung Galaxy Watch. In the UK, the Galaxy Watch 4G is exclusively compatible with EE mobile contracts. Your watch includes an eSIM, which is then used to pair your watch with your device and connect to your plan. The smartwatch costs £20 a month on a 24 month contract, which entitles you to unlimited data usage on the watch itself. Call and text allowances are shared from your smartphone plan. As a little sweetener, EE is adding an additional 1GB of data to your phone tariffs. The cellular function of the watch works flawlessly, allowing you to receive calls, texts, and use data when you're away from your phone or a Wi-Fi network. The Samsung Galaxy Watch is the best smartwatch Samsung has ever made. It's more attractive than previous incarnations, and comes packing some neat new fitness tracking abilities, making for a compelling package. Its availability in two sizes will definitely help it appeal to more people. It also has a very good battery life, and Tizen is the best smartwatch operating system out there. I can't help be feeling the Galaxy Watch doesn't live up to its true potential, though. Bixby is useless, and third party app ecosystem is barren, and there's just something about the design that is off. The Galaxy Watch's biggest problem is that Samsung hasn't given you a killer reason to buy one and keep wearing it. Apple promises the Apple Watch could save your life as well as pay for your Starbucks and give you calendar notifications on your wrist, the Galaxy Watch can just do the latter.